When planning a housing development, it is natural to have some doubts about which design assumptions may turn out to be controversial to external stakeholders and the public. Will the proposal fly or tank? And if it’s the latter, what are the main objections? Generally, the more significant the project, the more it will attract interest and receive a wider range of objections. In this blog, we provide some suggestions for what to do to garner support for your project. The key is to engage a wider audience to obtain a more balanced and favourable response, allowing you to finalise your design faster with better input from the public. A study by market research agency YouGov and Shelter on the ‘silent majority’ established that an astonishing 69% of respondents were positive or neutral about house building in their area. Even across age groups, supporters tended to outnumber opponents by 5 to 3, subverting the common notion that new developments are immediately viewed negatively by the community. Notably, those who held favourable views tended to be more likely to use social media and were less likely to appear at traditional public engagement events. For project owners, it means that those busy town hall meetings may show only one side of a bigger picture, and are perhaps not the best means to discuss and identify the aspects that carry support for your scheme. YouGov and Shelter’s research suggests that it pays to consider what elements in your project appeal to specific stakeholders and communicate that clearly. The YouGov study asked respondents to imagine a proposal for a new housing project in their local area and choose amongst a range of scenarios that may make them more likely to support a project. We have summarised these scenarios into four broad categories: neighbourhood improvements, the architectural design, aspects relating to project tenure, and the inclusiveness of the design process (see below). 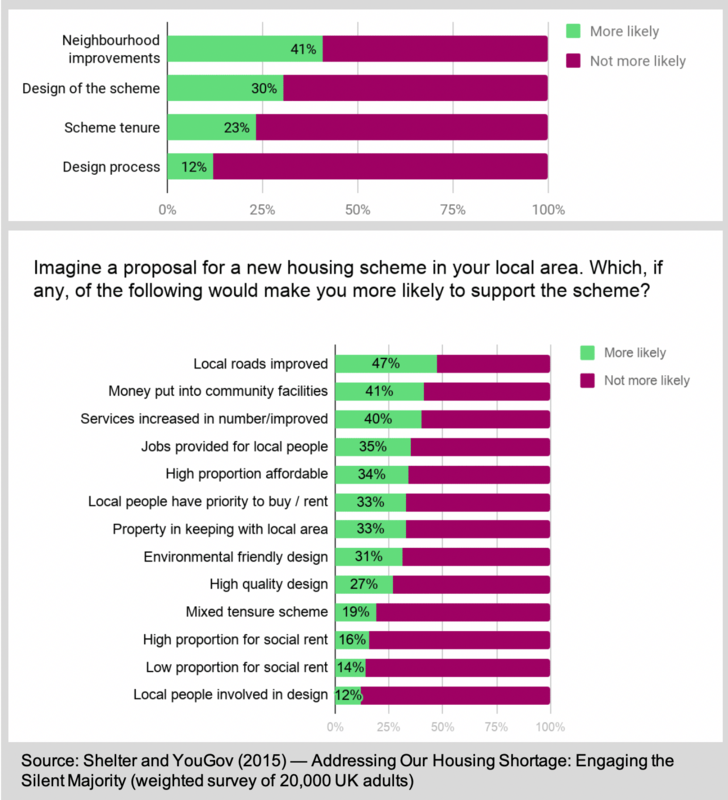 Neighbourhood improvements (41% more likely to support): New development projects can have a strong positive impact for an area, and improvements to local infrastructure (roads, community facilities, services, improvements to local people) are crucial aspects to attract support for a project. Sometimes, small improvements are equally important, such as fencing and similar smaller investments. In addition to direct financial contributions, consider indirect outcomes, such as protecting the availability of local services (e.g. post office, bank facility, doctor practices) and jobs. Design of the project (30% more likely to support): This relates to how your development will be experienced, both by occupants and those visiting the area. For garnering support, build quality such as the environmental friendliness of the design, and the way it would connect to the buildings nearby is secondary to neighbourhood improvements, but important nonetheless. Projects can consider access routes, green space, and other public realm improvements. Project tenure (23% more likely to support): The project has a greater chance of support if includes an element of affordable housing or social housing available for local people. Generally, it suggests communities prefer mixed-use developments that also provide suitable new living space for local people. Inclusivity of the design process (12% more likely to support): This can be an important additional component in garnering support for your project, especially if the existing site is inhabited. While the least likely to generate support, it can still be a deciding factor in some cases and may be more relevant to larger projects with a social contribution, such as estate regeneration projects in urban areas. Develop an engagement plan that identifies relevant audiences beyond the immediate vicinity. A meeting with the local planning authority can provide insight into the relevant stakeholders and the community’s wishes. Consider a lightweight and easy-to-use engagement campaign to identify ideas that could make your scheme attractive to a wider audience. Besides mail shots and consultation events, engagement via social media is an excellent method for reaching additional demographics beyond the typical public meetings. Community engagement tools that support an interactive dialogue over a period of a couple of weeks help you build goodwill with local residents. It also enables identifying audiences who will want to receive further updates going forward. Consider embedding accessible interactive visualisations of your project in your community engagement, enabling you to collect feedback on the surrounding areas and the scheme itself. Responses on the basis of interactive visuals of a scheme also raise the relevance and actionability of feedback, making your time engaging more meaningful for all parties involved.